Here are some more jersey concepts! 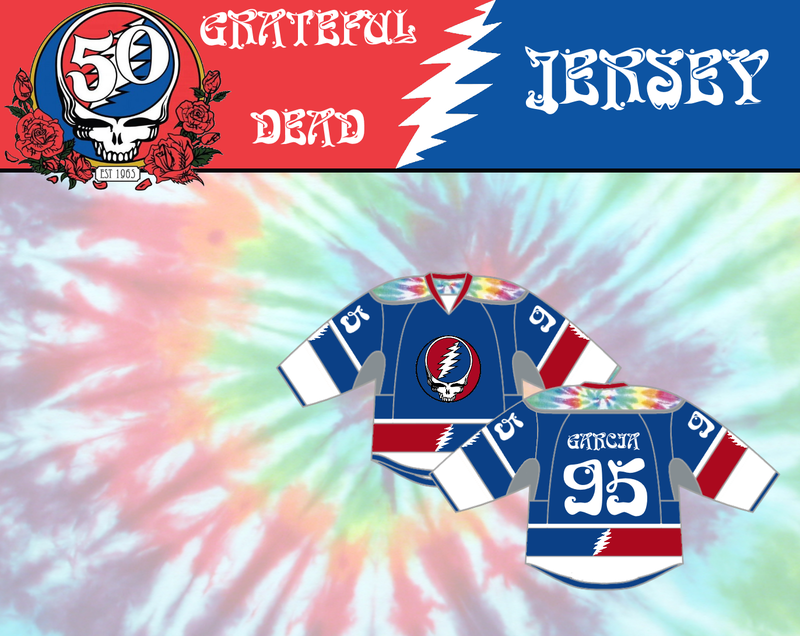 As a Deadhead, I decided to make a jersey for the 50th anniversary of the band, and this one adds a lot of aspects of the band into one hockey jersey. The main logo, in the center of the jersey, is called ‘Steal Your Face’, or a Stealie. (I have one as my profile pic) and it was an album cover, that has now become a symbol of the band. There’s also tie-dye shoulder yokes, as the Dead spearheaded the tie-dye shirts. There’s also lightning bolts on the arms and waist separating red and blue, as a reference to the Stealie. There’s also a little bit of grey in the armpits as a reference to one of the Dead’s most popular songs, ‘Touch of Grey’. Let’s be honest – Aside from the Caps’ alternate jerseys, the Capitals have one of the worst jersey sets in the league. 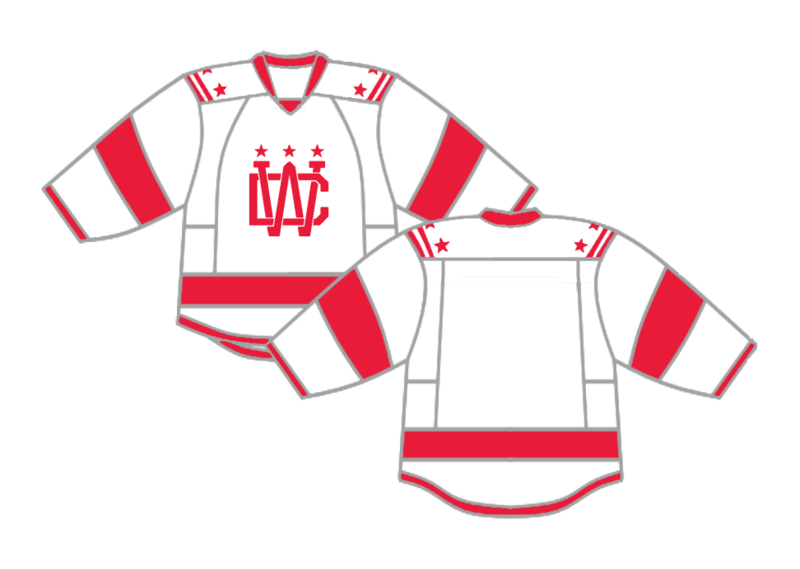 As a part of a contest on Hockey Jersey Concepts, I had to use two colors for the jersey, and I went with a modified Winter Classic logo aside the DC flag. The jersey highlights the red and white of the flag, and puts the flag (See it here) on the shoulders. When the Dallas Stars introduced their current victory green and black jerseys, they were a huge step forward. But in a video released by the Stars, they reveal concepts that didn’t make it on the ice, and one of them was a blue and gold color scheme. 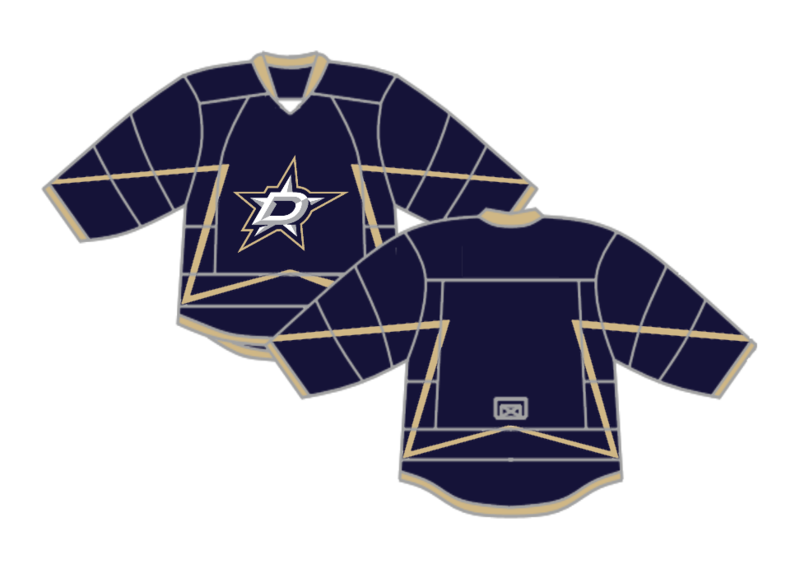 I decided to run with that, and put a star back on the jersey, so here’s a gold and blue Stars jersey. Anyways, that’s all for now! Let me know what you think of these concepts in the comments below, and I’ll see you whenever I get around to posting again! Previous Post Did Ryan Kesler’s Extension Make his Deal the Worst in Hockey? Those are sick! Do more!